The second GOP debate will air on CNN on Wednesday, and it is sure to bring just as many drinking games and face-palm-worthy quotes as the last. Eleven candidates have been invited to the primetime debate, including the two Republican frontrunners, Donald Trump and neurosurgeon Ben Carson. Sure, Trump's offensive comments and insults are often louder than any of the other candidates, but he certainly isn't the only candidate with those views, and that's exactly why you should worry about Carson more than Trump. Carson, who has just as little political experience as Trump, has very similar immigration plans to Trump and even more restrictive ideas for healthcare — specifically women's healthcare — and a very misguided view of the Black Lives Matter movement. Carson is the number two choice for Republican voters in Iowa, New Hampshire, and South Carolina, according to a new CBS poll released Sunday. 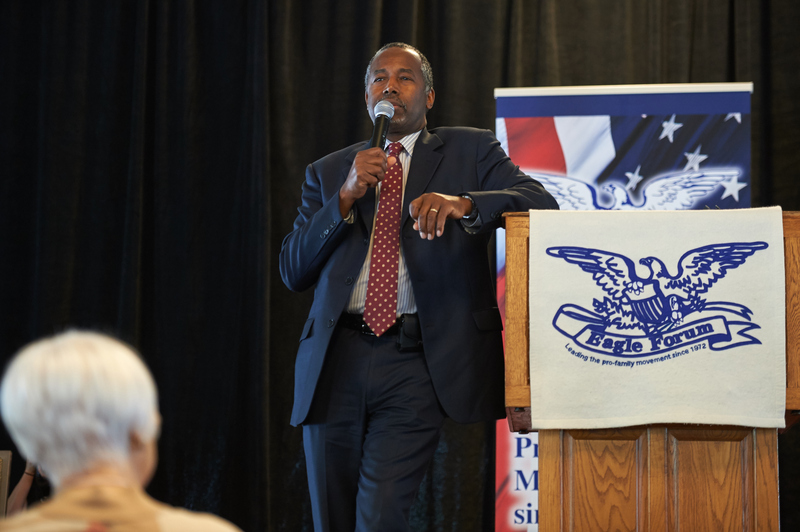 Carson has pointed to his career as a neurosurgeon, his years on the corporate boards of Kellogg and Costco, and the success of his nonprofit, the Carson Scholars Fund, as evidence that he would make a good president, according to CBS. Carson, like Trump, has yet to show that any of his experience would be applicable to foreign policy or policy writing, generally. Politico said that older conservative voters love Carson because "he’s just like Trump, only not so rude." That and these four other reasons are why Carson should scare you more than Trump does. Carson said that he would set up a six-month registration period, and immigrants who have a "pristine record" and "haven't been causing problems" would get to stay in the U.S. as guest workers. He did not, however, say anything about the structural biases and inequalities that immigrant workers face in the U.S. or how he would address those. The most frightening thing about Carson's comments about immigration, though, are how quiet he is about them. Trump scares us because he is loud and upfront, but Carson should be even scarier because of the way he veils his ideas with politeness. [The brain of a one-year-old baby] is a very sophisticated organ, and the fact of the matter is it’s much more sophisticated than these little creatures that the environmental protection agency and others are trying to save, you know? Why don’t they spend their time and effort trying to save human life? Trump, who said he recently changed his views to become anti-abortion, was pro-choice for many years, according to On The Issues. Trump also hasn't ever spoken against a woman's right to access healthcare that includes abortion, and he even defended Planned Parenthood in the aftermath of the anti-abortion attack videos about the group, saying, "I've had many Republican conservative women come up and say Planned Parenthood serves a good function other than the one aspect [of abortion]. We have to help women." Neither Trump nor Carson have foreign policy experience, but Trump at least attempted to claim that he had experience from working with other businesses abroad, which might count for something small? Regardless, Carson has an even smaller amount of foreign policy experience, and he doesn't even attempt to hide it. In a March interview with conservative radio commentator Hugh Hewitt, Carson said the Baltic states should join the North Atlantic Treaty Organization even though they are already a part of the organization, according to The Hill. Then, he said that Shiite Muslims and Sunni Muslims should form an alliance, which is so unlikely it's virtually impossible and it goes against almost all of Islamic history. She said, 'What's going on?' and they said, 'Oh, nothing.' That's not respectful. That's her neighborhood. You know she has a right to know what's going on there and we need to teach our police to be respectful. But then Carson said that the movement should call itself All Black Lives Matter and should address abortion and violence among black neighborhoods. That comment, though, completely misses the point of the Black Lives Matter movement, which is centered around police brutality against black people and the fact that it has gone on long enough that it's almost become normal. [Ferguson] also conjures up an image of the people being unwilling to actually face the facts. I think the community is unwilling to face the fact that Michael Brown was a bad actor. Carson's comments seem less offensive or abrasive than Trump's, because he often doesn't scream them or use blanket language that scapegoats an entire population. But this quality is exactly what makes them more menacing. Carson's views are just as scary as Trump's, but they seem more legitimate because he presents them with an air of politeness.